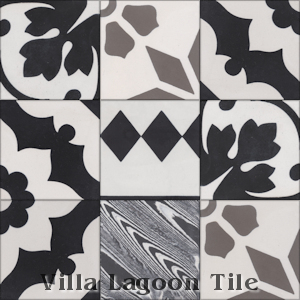 "Black, White, & Gray (PS)"
These are multi-color 4" cement tiles, using colors from the South Beach Palette. People love our engineered cement tile patchworks so much, that when we were brainstorming for four-inch cement tile ideas, we had a stroke of brilliance. We can cut good 4" tiles from overruns, mis-pours, and other well-balanced groups of colors for mixed patchworks. The results are beautiful, and a bargain! Standard Price:$1.45 per tile ($13.49 / square foot)48 tiles per box. One full box minimum order. Please Note: These tiles are cut, and fill the box at random. The tile you will receive will be similar, but not exactly as shown. 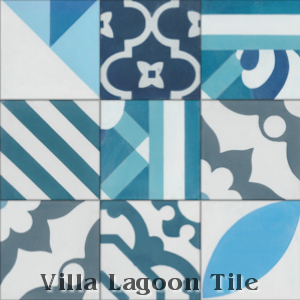 4" Cement Tile, 5/8" thick, 48 tiles per box, 9.3 tiles per square foot. 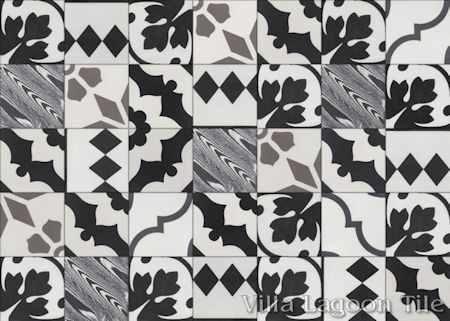 Random cement tile patterns using Black, White, and Grays from the South Beach Palette. 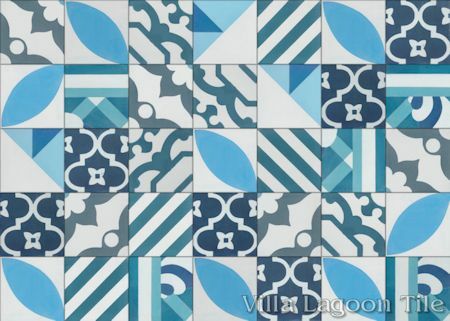 Random cement tile patterns using Blues and White from the South Beach Palette.